Yesterday, we nipped out for a ride before the tail end of tropical storm Bertha hit. 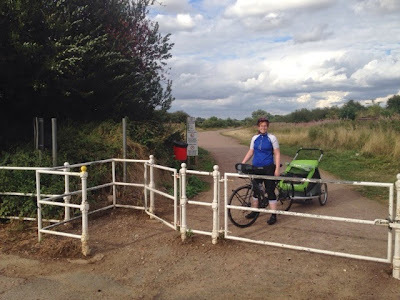 We set off down the cycle path along the disused railway line from Stanwick Lakes to Thrapston, turning off the path and taking to the road to ride through Denford and Ringstead. Our new Ortlieb handlebar bags arrived last week, so having fitted them we took them out for a test run. The path was busy with people walking, and the surface was very badly potholed as we got closer to Thrapston. Bumpy track and potholes are more of a challenge with the trailer. There were a LOT of big potholes on this path, and finding a route through so that both trailer and bike wheels avoided the worst of it left me zigzagging a very peculiar path, and absolutely killed our average speed (down below 6mph!). The terrain didn't bother the girls - both dozed off mid- ride, but the grown ups were pretty happy to turn off the rutted path onto some Tarmac as we crossed the A14. 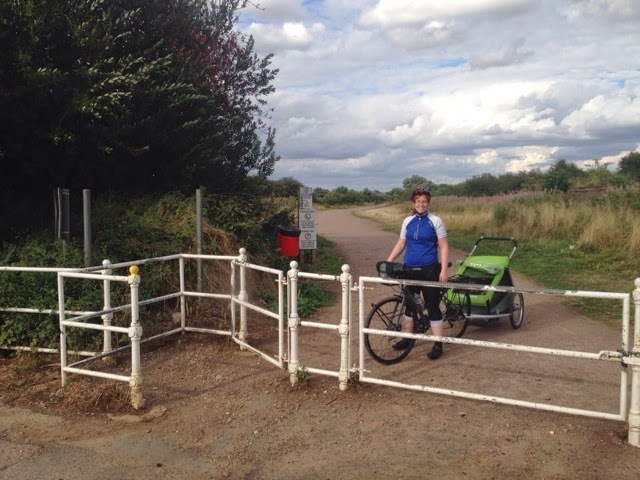 The biggest headache of the day was getting in and out of the gate at the end of the path (below), which proved impossible with the trailer. We had to unhitch and lift it over, but we managed without too much fuss.